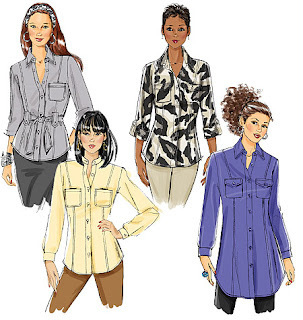 Even though I've purchased a bunch of top patterns recently, I started making tops, specifically button down shirts using Butterick 5678. I'm starting this post with a photo of the unbuttoned shirt on Lulu because I am finally smaller than Lulu and it won't button on her! See I really wanted to do a review of the pattern now since I've already cut out another one. Also it will be next weekend, before I get pics of the shirt on me. Fabric is a blue cotton chambray recently purchased from Fabric Mart. The buttons are from the stash and I used a lightweight fusible interfacing from Fashion Sewing Supply. I chose this pattern because it comes in cup sizes and has princess seams that start from the shoulders. I prefer princess seams from the shoulder line rather than the ones that start in the armhole. This one also has several lengths, different sleeve & collar views and pockets. Even though I won't use the pockets, again just a personal preference. I started with the C cup pattern pieces. Then I added space from under the bust curve down. Starting with 1/8" increase out to 5/8" at the waist to the hemline. I made this adjustment on both sides of ALL of the pattern pieces except the front piece. There I only made the addition to the side of the piece and not the facing on the front. The sleeve alterations were discussed in this post. This was an easy sew. Even with the alterations I made to the pattern pieces everything fit together perfectly. So I sewed it together using 5/8" seam allowances. However, the waistline was still a little tight. So I unpicked the side seams and stitched them at 3/8" from above the waist to just below it then top worked perfectly. The collar and collar stand went on painlessly, so painlessly that I highly recommend this pattern to anyone who has it in their collection. When I sewed the cuffs to the sleeves, my cuffs came up a little short. To compensate I added another pleat to each sleeve. This worked really well. So well that I will be using the second pleat going forward. See I have thin wrists and normally the cuff is too big/floppy. These are perfect now. Topstitched collar and front facing ~ better topstitching! A few more construction details - my buttons are stitched on by doubling the thread and running it through Thread Heaven. I do this to strengthen the thread and so that I don't have to run the needle through the buttons so many times. Three passes with the doubled thread is usually enough and since I had to sew on 13 buttons I needed this to be quick. My interior is serge finished although the pattern recommends french seams. I also turned the hemline up just once instead of the two times that the pattern suggests. This is my wearable muslin but it turned out so well with just a few corrections needed, which I've listed below, so that I'm moving ahead with the next version. The shoulders are hanging off my shoulder blades by a half inch, so I corrected that on my pattern piece. I also shaved off 1/2" on my cuffs because they are a little too long for my liking. I added a smidge more to the front pattern pieces so that all the seams will be sewn at 5/8" per the pattern instructions. Like I said I have a few more ideas for this pattern. I want to use it to make a dress, several button downs in a variety of fabrics - not just shirting, and also as a topper. It will be a great layering piece for fall and winter so it will probably show up quite a few more times here this fall/winter. The only downside is that the pattern has been discontinued but here are a few suggestions on current patterns that can be used. Love this top Carolyn;the details look outstanding! I've made this top, and agree that this is a great pattern..
Can't go wrong with a classic style like that. I bet the colour looks great on you! I love it! That fabric looks so soft. I absolutely love the chambray. Good tip on the buttons. I felt like I was sitting there for forever sewing buttons because I 'had to' go through so many times. I couldn't believe it when I found out that the pattern had been discontinued. A great classic pattern. Your shirt will look great with everything from jeans to, well, you name it! Love your shirt. I look forward to seeing you model it. I love shirts. But lately I find myself staying away from cuffs. Not sure why. I need to up my sewing again. I so much enjoy your sewing blog! nice job on the blouse! I love chambray fabric. This is a lovely blouse. I have been eyeing this pattern because it has such classic lines and would be easy to alter to fit. For the same reasons I think it would make a fabulous dress. Nice to know it is an easy sew. I have this pattern in my stash but have not sewn it yet. Yours is looking great!